After dropping Isabel off at nursery, I headed to the station to begin my convoluted journey to Llandegla via Shrewsbury and Wrexham. As it was the middle of the day this time I was able to catch the bus to Llandegla rather than having to fork out for a pricey taxi! I set off walking from the Offa's Dyke signpost in Llandegla shortly after midday, where it was pleasantly warm and there was barely a cloud in the sky. After crossing a couple of main roads, I headed across a few fields to reach a minor road at Hafod Bilston. Here I left the Offa's Dyke path to start my longest variation in the route so far because I wanted to bag Cyrn-y-Brain. I followed the gated minor road SSW for around a km before branching off left on a public footpath onto the access land. After a few hundred metres it became clear that the good track I was following wasn't actually concurrent with the right of way and was instead looping back on itself towards Llandegla forest. Rather than trying to follow the right of way, I opted for a direct line to the summit given I could clearly see one of the masts. However this was a mistake! The energy sapping deep heather seemed to go on forever and was easily as bad as the worst of the Berwyn heather! Eventually the angle of the slope began to ease and I was soon on the summit of Cyrn-y-Brain (Marilyn, Dewey), which was marked with a wind shelter cairn and surrounded by an array of communications masts. After a late lunch on the windy summit, I headed NE along the track past the last of the masts to reach the trig point and the grandly named Sir Watkin's Tower, which appeared to be nothing more than a cairn on top of a grassy knoll! I followed a reasonable path NE alongside the fence, before crossing it at a stile to reach a well cycled forest track, which I followed to rejoin the Offa's Dyke path. I headed SE across the moorland, on a path that was predominately made from railway sleepers to reach the minor road just before 3pm. After following the road south for around a km, I entered the woodland of the World's End Estate and was greeted by a sign informing me that CCTV was in use; I wondered if the trees had all been fitted with cameras! After descending quite a steep road and crossing a ford, I stopped for a quick break on a handy bench near the bottom of World's End crag. Are there cameras in the trees then? The next few kilometres are probably my favourite bit of the path so far! I traversed several scree slopes below towering limestone crags, which were quite a contrast to the moorland from only an hour ago. 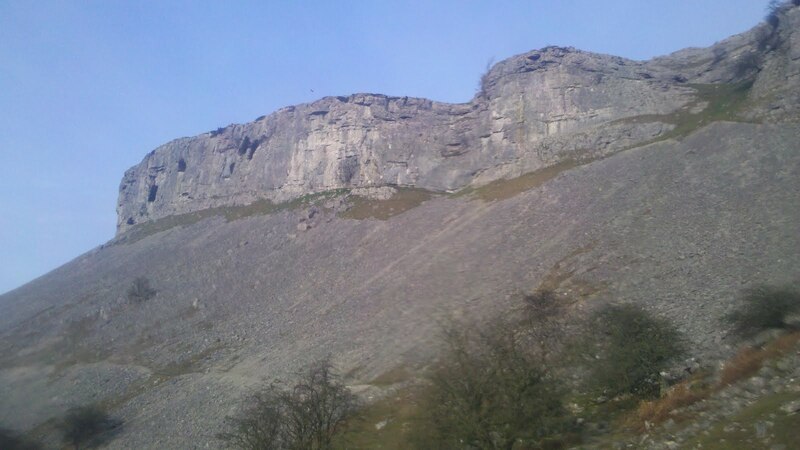 The views were excellent and the sun covered crags looked very inviting; I shall have to come back some other day! I rejoined the road, which I followed for several km, past Dinas Bran castle to reach the Panorama Walk. The views across the Dee valley and up to the crags were excellent from here. Eventually I left the road and descended through the pleasant Trevor Hall Wood to reach my B&B on Trevor at 6pm after a good afternoon's walk. Nice pics, Alistair. I've not done the northern half of the ODP yet - these pics make me wonder why not!